Good old gumshoe detective work may have exposed Apple's electric car plans. An Apple self-driving EV has been a rumor for the last year, but the company is staying silent on the project. Recent hires found via LinkedIn updates, showed Apple went on a hiring spree for EV charging engineers, including Nan Liu, an EV wireless charging engineer, and Kurt Adelberger, a former Google charging professional. Lastly is Rónán Ó Braonáin, formerly of BMW, who specializes in integration of charging stations and communication between EVs and utilities. Sources also say that Apple has been connecting with charging station manufacturers to learn how to charge EVs. Apple already gives its employees free access to charging stations, so experts believe that the new communications surround the potential Apple EV. There's plenty of charging station manufacturers with which Apple could connect, including General Electric, VersiCharge, AeroVironment, ChargePoint, Siemens and more. "It would be natural to assume if Apple is going to have a full battery electric vehicle that creates a seamless consumer experience the way Apple does, the charging infrastructure and its availability would be of paramount importance," the source said. While many people believe the recent EV charging news is a certainty of an Apple EV, others think it could be a response to the mass shortfall of chargers. In California, alone, consumers will need 13 to 25 times the current available charging stations by 2020 as a projected 1 million EVs hit the road, according to the National Renewable Energy Laboratory. Only time will tell whether Apple is creating their own EV or reading the EV charging crystal ball, but one thing is for certain: something interesting is going on behind the closed doors in Silicon Valley's biggest buzzword. 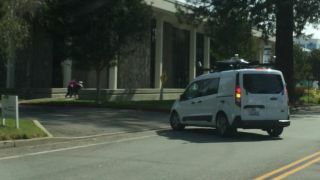 Spotted: Is Apple Car self-driving tech being tested with this white van?